This is the authoritative, bestselling guide that professionals and students turn to for a complete introduction to motivational interviewing (MI), the powerful approach to facilitating change. The book elucidates the four processes of MI engaging, focusing, evoking, and planning and vividly demonstrates what they look like in action. A wealth of vignettes and interview examples illustrate the "dos and don'ts" of successful implementation in diverse contexts. Highly accessible, the book is infused with respect and compassion for clients. The companion Web page provides additional helpful resources, including reflection questions, an extended bibliography, and annotated case material. New to This Edition: reflects major advances in understanding and teaching MI fully restructured around the new four-process model all chapters now authored by Miller and Rollnick additional case examples and counseling situations reviews the growing evidence base and covers ways to assess MI fidelity. William R. Miller, PhD, is Emeritus Distinguished Professor of Psychology and Psychiatry at the University of New Mexico. 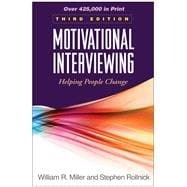 He introduced motivational interviewing in a 1983 article and in the original edition of this book, with Stephen Rollnick, in 1991. His research has focused particularly on the treatment and prevention of addictions, with broader implications for the psychology of change. Dr. Miller is a recipient of the international Jellinek Memorial Award, two career achievement awards from the American Psychological Association, and an Innovators in Combating Substance Abuse award from the Robert Wood Johnson Foundation, among many other honors. The Institute for Scientific Information lists him as one of the world\u2019s most cited scientists. Stephen Rollnick, PhD, is Professor of Health Care Communication in the School of Medicine, Cardiff University, United Kingdom. He worked as a clinical psychologist in mental health and in primary health care for many years, and then turned to how motivational interviewing could be used to improve challenging consultations in health and social care. His research and guidelines for good practice have been widely published, and his work on implementation continues, with a focus on children with HIV/AIDS in Africa and pregnant teens in deprived communities. Drs. Rollnick and Miller are corecipients of the Engel Award from the American Academy on Communication in Healthcare.